There was way too much going on in this book. I really wish that instead of introducing new plot elements and political intrigue, Roth had stuck with fleshing out and finishing what she already had going. By the end of the book I was totally overwhelmed by all of the revolutions and counter-revolutions and counter-counter-revolutions and just didn't care anymore. I also wasn't a fan of the dual points of view. For one thing, I felt like it spoiled the ending of the book. It made things fairly blatant, at least as far as I was concerned. For another thing, the two voices were almost indistinguishable. I found myself having to review the section headers to see whose voice I was reading in, which is never a good thing. As for the positives, as far as the writing was concerned, I was impressed that she had the courage to take her ending to a potentially dangerous place as far as her readers are concerned. She didn't give in to the pressure to wrap things up neatly, and I appreciate that. Unfortunately, there wasn't much else that impressed me. I loved Divergent, liked Insurgent, and tolerated Allegiant. It was by far the weakest of the three books. I'm glad I read it, because I did like the way Roth ended things, but I was bored for the majority of the book. There were many times I was tempted to give up and just read spoilers. I'm glad I didn't do that. I think the ending is strong enough to make the first three quarters of slogging through it worth the effort. That said, this book just didn't capture me the way the other two did. 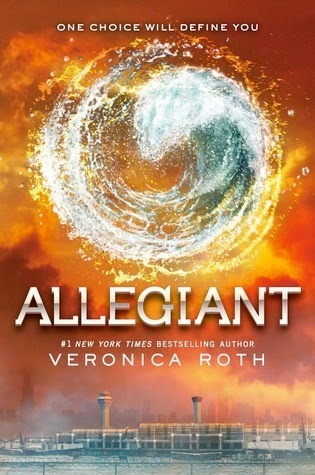 I didn't care about the characters, I was distracted by all of the plot threads, and I didn't find the voices of either narrator (Tris and Four) to be particularly well-done or likable. I was, frankly, bored for a large part of the book. My recommendation is that if you've started the series and made it this far, it's worth finishing. It's not a huge time commitment and it does move along fairly quickly, even if it feels like it's dragging at parts. However, it's not a series that I would recommend to someone who hasn't already started it. I loved Divergent, but with the problems in Insurgent and Allegiant, I feel like it was just an ok series. So if you're not typically a YA reader, this isn't something you're going to be missing out on if you skip it.